Larvae are legless, curved and are whitish to pink or orange. Larvae approximately 2 mm long when mature. Adults are medium to dark brown with transparent wings, long legs and large eyes. Their bodies are about 2 mm long, with males measuring slightly under 2 mm and females slightly longer. These midges prefer new shoots and lateral shoots for egg laying. Fused leaves (“rosette” galls) and grey – silver appearance due to webbing or hairs on new shoots of Russian knapweed indicates their presence. On average, adult males live less than a day and females 2-3 days after they emerge in the spring. Eggs are laid on shoot tips. Larvae feed within the gall among silky webs (hairs). Larvae go through three instars before pupating. They overwinter as pupae, but may have more than one generation per year. In their native Uzbekistan, they may have as many as four generations per year each lasting approximately one month. Galls result in stunted growth and plant stress, limiting growth, flowering and seed production. 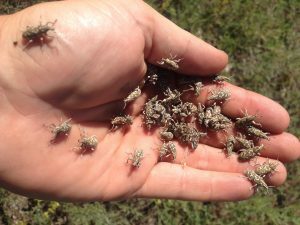 Currently, insects are available in Montana through a limited number of sources. The Montana Biocontrol Coordinator will share the contact information for these sources with interested parties. A native of Uzbekistan it seems to thrive best in disturbed and -irrigated or moist areas due to resulting new growth of knapweed plants. Grazing by wildlife or livestock may impact populations when the midges are at low levels. This agent is still being monitored for effectiveness, however, it is established in several sites in MT and research in WY suggests it can limit seed production by 91% and reduce above ground biomass by 34%. The midges are best collected as mature galls from affected plants; as sweeping is difficult and can damage the delicate adults. Galls can either be placed directly in the infested area throughout the growing season according to specific protocols or maintained indoors for careful release of adults after emergence. Mowing the infected site prior to releasing insects may increase new shoots, for galling later in the season. . However, this may not be effective at dry sites where regrowth is limited by moisture. From 50-100 galls should be released to begin establishment efforts. Success should be monitored by looking for galls on Russian knapweed plants in current and subsequent years after release. Due to the lack of knowledge regarding establishment and impact they should not be relied on as a sole strategy for managing Russian knapweed on a landscape level. They are best used in tandem with other management strategies including additional biocontrols, chemical and mechanical methods if eradication is your goal and to reduce spread while insects are establishing. Consult your local weed district or Extension Service for Russian knapweed management advice. Larvae are curved with a white body and head capsule. Adults are near black and somewhat of a hump-shape appearance. Adults approximately 2 mm long. Males, if present, are smaller than females which also have a more prominent abdomen. Their legs are light brown with darker areas nearer to the body. They have transparent wings and long antennae. Presence of the gall wasp is best indicated by the presence of galls on Russian knapweed plants. Eggs laid in meristematic tissue are not visible under field conditions and adults may be difficult to see due to their size. Adult wasps emerge from the previous year’s galls in the spring – typically from May to June. . Females begin laying fully developed eggs immediately. Larvae hatch from eggs and begin feeding on plant tissue forming galls. Larvae develop through three instars with the third instar going dormant around mid-summer through the winter before pupating in early spring. Pupation occurs inside galls. Some larvae may hibernate for a second winter before pupating. A higher proportion of wasps are female than male. In the lab, galls stress plants and reduce flower and seed production but under field conditions impacts are still being determined. Currently, insects are available in Montana through a limited number of sources. To obtain the contact information for these sources, reach out to the MT Biocontrol Coordinator. In its native range it is well-adapted across a range of moisture regimes and environments though it seems to thrive best in areas with minimal disturbance from grazing and cultivation. Initial releases of this wasp were made in Montana in 2009 and therefore it is not yet widely established and the full impact on Russian knapweed is still undetermined. Wasps are best collected directly from galls as sweeping is difficult and can damage the delicate adults. Galls can be placed directly in the field in early-spring before adults emerge. Ideal release sites should have actively growing plants that are ~6 inches tall Success should be monitored by looking for galls on Russian knapweed plants in subsequent years. Due to the lack of knowledge regarding establishment and impact they should not be relied on as a sole strategy for managing Russian knapweed on a landscape level. They are best used in tandem with other management strategies including additional biocontrols, chemical and mechanical methods if eradication is your goal and to reduce spread while insects are establishing. Consult your local weed district or Extension Service for Russian knapweed management advice and/or recommendations. There are three strains of this species established in the U.S. They are morphologically identical but differ in their life cycle. Oval shaped eggs are less than 1 mm in diameter. They are white turning orange with maturity. Larvae are small white grubs approximately 1-4 mm long. The final of three instars has a brown head capsule. Pupae found in the soil are white and 2-4 mm long. Adult beetles are of similar size, light-brown or coppery in color, with large hindlegs. Shot hole feeding patterns on tansy ragwort leaves, particularly in rosette stage in late summer or autumn can indicate adult presence. There is a native flea beetle that also feeds on tansy ragwort but the shot holes are smaller and more common during the spring and early summer. Larvae may also be found in the root crown in early summer, however, beetles are very small and jump when disturbed. Of the three strains present in the U.S., the Italian CAD (cold-adapted) and Swiss strains are more tolerant of higher elevation sites and cold winters than the coastal Italian CPNW (Coastal Pacific Northwest). The Italian strain overwinters as either eggs or larvae. Larvae begin feeding on or with in roots in the spring, return to soil to pupate in the summer and emerge as adults in late summer. These adults continue feeding on foliage and lay eggs in late summer early fall on lower leaves or near the soil. Beetles from the Swiss strain overwinter as eggs laid the previous summer on tansy ragwort rosettes. Larvae hatch in the spring and initially feed on leaf petioles prior to burrowing into the root crown. Mature larvae pupate in the soil in late spring early summer. Adults then emerge in late summer and spend 2-3 weeks feeding on foliage before laying eggs. Adults are present until heavy frosts. Larval feeding on roots can reduce plant energy storage, impact reproduction and cause death. Adult foliar feeding reduces photosynthesis as well as water and nutrient transport. In drought stressed plants, this damage can lead to plant death. Both the CPNW and Swiss strains are available in Montana. The CAD strain is difficult to collect and therefore not as readily available. We have seen good establishment of the Swiss strains where it has been released but it doesn’t appear that the CPNW strain establishes in Montana. If you are interested in obtaining these insects view the biocontrol vendor list for options. This biocontrol agent is very effective at reducing established infestations of tansy ragwort. 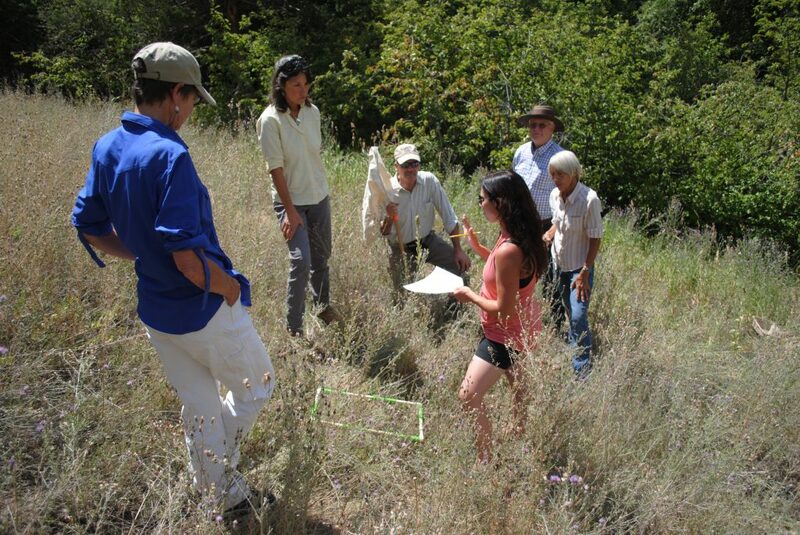 Research in Oregon showed a 90% reduction in flowering plants six years after biocontrol introduction. The flea beetle appears to be just as effective in Montana as it is in Oregon. The Swiss and Italian CAD strains are more tolerant of higher elevation sites. This biocontrol works well with Tyria jacobaeae. Adult beetles can be collected using a sweep net or insect vacuum. Italian CAD and Swiss strains are best collected in late summer. A sieve might help to sort beetles from debris collected along with beetles. At least 200 beetles should be released on sites where no beetles are established. Establishment can be monitored by observing plant foliage for shot hole feeding or looking for adult beetles the following summer after release. Biocontrols should be used on sites where infestations are heavy and immediate eradication is not the primary goal. Where the biocontrol is well-established other physical, chemical or mechanical control methods should be avoided so as not to interfere with insect populations. For more information on control methods and herbicide recommendations contact your local weed district or Extension Service. Eggs are laid in clusters under tansy ragwort leaves. Initially yellow the eggs turn black with maturity. Larvae are initially orange turning orange and black striped as they develop through three to six instars. Larvae in the final instar are up to 25 mm long. Adult moths have black forewings wings with two red dots and red on wing borders. Hind or underwings are solid red. Moth wingspan can be up to 4 cm. Larvae can be found in groups (10-30 larvae) on bolting or flowering tansy ragwort plants. Plants may be completely defoliated. Pupae overwinter in shallow soil or leaf litter. Adults emerge, mate and lay eggs in late spring or early summer. Larvae begin to feed on undersides of leaves, eventually feeding on stems and buds as they mature. Larvae in the final instar retreat to the soil to pupate in late summer. Larvae can completely defoliate plants causing stress and reduced storage in the root system. Flowering and seed production may be greatly reduced. This agent appears to be more effective in habitats with a drier, and shorter growing season. Interstate shipment of the moth is prohibited due to observed non-target feeding on native species. It may be possible to distribute insects that are already present in Montana to new locations. For more information on this, contact the Montana biocontrol coordinator. This biocontrol works well in conjunction with Longitarsus jacobaeae. It has been shown to be more effective in areas shorter and drier growing seasons. If restrictions against redistribution of this insect are not in place, insects can be collected in the larval stage and moved to intended areas. 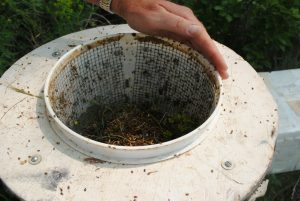 Larvae can be collected by shaking plants to force larvae to drop into a collection pan or bucket. From 50-100 larvae should be released on sites where infestations are heavy and immediate eradication is not the goal. Establishment can be monitored by looking for larvae the following summer and looking for defoliation of plants. Where the biocontrol is well-established other physical, chemical or mechanical control methods should be considered carefully so as not to interfere with insect populations. Adult beetles are 10-12 mm long with red heads and black eyes. Their bodies are gray with lighter gray and red markings on the underside of the thorax. Adults have yellowish brown legs and long antennae. Larvae are longer (up to 20 mm), with clear segmentation and no legs. They are white with a near yellow head capsule. Adult O. erythrocephala are very active and can often be seen flying above leafy spurge plants. Ringed grooves chewed around the stems of plants can also be indicative of their presence. Larvae can be found by cutting into stems and looking for burrows or the larvae themselves. Dead stems and tops of stems are also a good indication of the insects presence, larvae or adult. Adult beetles emerge from soil in early to mid-summer. They must begin feeding for approximately two weeks before they reach sexual maturity. After mating females girdle the stems of leafy spurge plants and chew holes above the rings where a single egg is deposited in each hole. She can lay up to 40 eggs. Eggs take 7-10 days to hatch. Larvae then burrow down stems to root crowns where they continue to feed on plant tissue in crown and lateral roots. Larvae overwinter here until they pupate the following spring to emerge as adults later in the season. They typically have one generation per a year though there is a possibility that in some cases two years may be required for larvae to mature in colder areas of North America. Leafy spurge vascular tissue is damaged by larval feeding resulting in reduced above ground tissue, flowering and root reserves. Adults also girdle stems but their impact is far less than larvae. O. erythrocephala are readily available in Montana. If you are interested in obtaining these insects view the biocontrol vendor list for options. This species may only be effective on certain biotypes of leafy spurge, limiting its efficacy in many areas. Despite this, it is well established in many areas of the Western U.S. It is best paired with Apthona spp. 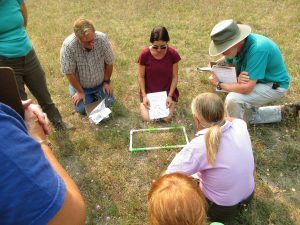 when using biocontrol agents to control leafy spurge. Adult stem borers can be collected in mid-summer at peak day time temperatures when leafy spurge flowers have emerged. Due to their ability to fly sweep netting is often less efficient than simply collecting them by hand or with forceps. 50-100 adults should be released per site for establishment. Successful redistribution can be assessed by looking for mined stems or larvae in the summer or next generation adults the following spring or summer. The red-headed leafy spurge stem borer should not be a primary method of control for leafy spurge. As with other weeds an integrated approach should be employed. Due to its deep root system (3-7 m) and the ability to regenerate from very small root fragments (>1/2 in long), hand pulling and mowing are often unsuccessful on established plants and can even help spread the plant. Small infestations should be treated with a labeled herbicide as soon as possible. Some combination of chemical and biological control is preferred on sites with established plants. Grazing with sheep and goats has been shown to weaken colonies of leafy spurge and can be paired with both Apthona spp. and O. erythrocephala. In these cases, herbicides can be used at the site perimeter to contain the weed. Leafy spurge is toxic to cattle so they should not be used to control the plant. Additionally, aggressive revegetation, particularly with grasses, should be employed to provide competition for weeds. Six species of Aphthona flea beetles native to Europe and Asia have been intentionally released in the United States for biological control of leafy spurge. Aphthona nigriscutus and A. lacertosa are now the most abundant and widely distributed. Adult flea beetles are small, measuring 3-4 mm in length, and vary in color from golden coppery brown to black. Larval beetles are 1-5 mm long, white to creamy yellow in color, with a prominent brown head capsule and very short legs. Aphthona spp. eggs are 0.7 mm long x 0.4 mm wide, light yellow soon after deposition, and darkening to a deeper yellow or light brown over the 12-19 days leading up to hatching and larval emergence. Small and shiny Aphthona spp. 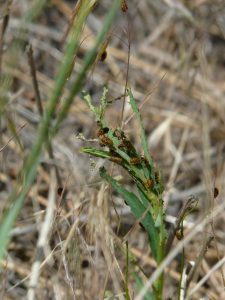 are typically the most commonly encountered beetles on leafy spurge. As their name suggests, leafy spurge flea beetles respond by jumping rather than by flying when disturbed. It is nearly impossible to differentiate among the four light brown Aphthona species (A. abdominalis, A. cyparissiae, A. flava and A. nigriscutis), or between the two dark brown or black Aphthona species (A. cwalinae and A. lacertosa) in the field. All three larval stages of Aphthona spp. dwell below the soil surface, feeding on increasingly more robust spurge roots (i.e., beginning on filamentous root hairs then moving onto the primary roots) before the third (and last) larval instar transfers its feeding to target spurge root crown tissue. Actively growing spurge plants under attack by low densities of adult flea beetles have conspicuous ‘shot holes’ chewed in the leaves. At higher density adult feeding, most of the leaf tissue is stripped away, leaving stems nearly defoliated, with little more than ragged or shredded remnants of the leaves left behind. Adult feeding can cause the leaves and tips of the stems to wilt and turn yellow or brown, but is not a significant source of spurge mortality. Gray patches of twisted, bent over and woody looking stems are indicative of areas within stands of leafy spurge where intensive larval feeding on root and root crown tissues impeded moisture and nutrient transfer to the point that spurge plants were killed outright. Aphthona spp. are univoltine, producing a single generation each year. Adults emerge from the soil in late spring or early summer, feed on leafy spurge foliage, and begin mating. Females begin depositing eggs on or just below the soil, near the base of leafy spurge stems within a week of emergence. Aphthona spp. lay 220-285 eggs over their 45-65 day adult lifespan; oviposition occurs at 2-5 day intervals, each time involving the deposition of a cluster of 3-30 eggs. Most of each female’s viable eggs are laid within the first two of the three month oviposition period. Larvae hatch from the eggs in 12-19 days, moving downward from the soil surface to immediately begin feeding on spurge roots. Larval beetles continue feeding through fall and early winter, pausing only when the soil temperature falls below 45° F. Third instar larvae resume feeding in spring once the soil temperature reaches 45° F, then move upward, just below the soil surface and not in direct contact with the roots of their host plants, before pupating. The lifespan of adult beetles varies according to local climate, and can be extended by cooler and moister environmental conditions. Damage is primarily caused by Aphthona larvae feeding on leafy spurge roots and root hairs. 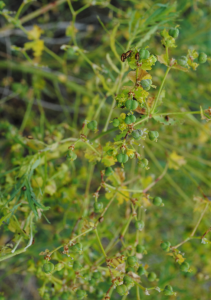 Aggregation occurs because the larvae prefer to feed on the roots of spurge plants previously or currently being attacked by other larval Aphthona; damage to host plants intensifies as larval density increases. In addition to reducing stored energy and nutrient uptake, larval feeding may also make injured spurge more susceptible to infection by plant pathogens present in the soil. Adult feeding on above ground stems, leaves and flowers also weaken the plants but not to the degree of larvae. Aphthona spp. are readily available in Montana. If you are interested in obtaining these insects view the biocontrol vendor list for options. 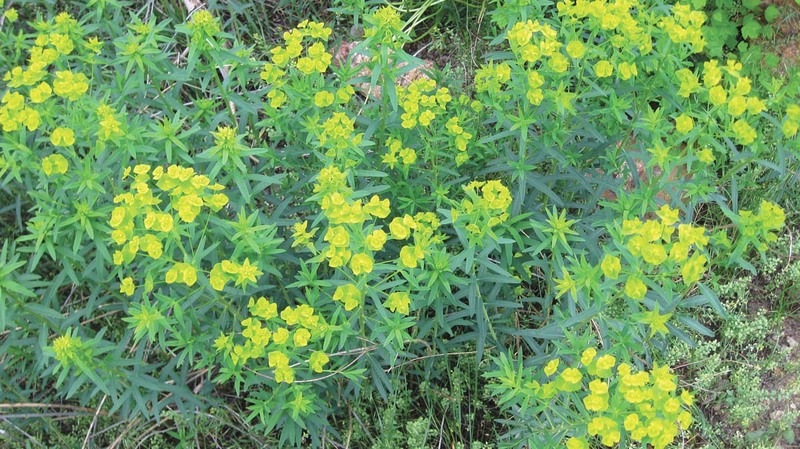 While leafy spurge is the primary host, the flea beetle has been reported to feed on other plant species in the Euphorbia genus, including the native Rocky Mountain spurge (E. robusta). The two dominant species, A. nigriscitus and A. lacertosa, appear to be successful in different habitats, with A. nigriscutis preferring drier sites with lower stand densities and shorter stem heights (below 40 cm). Aphthona spp. can easily be collected using a sweep net on warm sunny days, preferably when temperatures exceed 70° F and plants are dry. Care should be taken to store collected insects in paper bags or ‘breathable’ paper or cardboard containers that will keep them dry, because they can easily drown when condensation builds up inside plastic containers. Avoid escapees by folding over and stapling the top of paper bags, and securing caps to containers with masking tape. Collected beetles should be immediately stored at 40° F (i.e., in a cooler). No less than 500 beetles should be released to initiate effective Aphthona biocontrol treatments. Releasing higher densities of flea beetles will improve the success and speed of establishment. Research from North Dakota agrees with field observations in Montana, confirming that successful establishment of this agent is highly site specific. Leafy spurge stands with thinner canopies, and areas within spurge infestations that are less densely packed with the target weed (e.g., along the edges of leafy spurge patches; on sparse live plants surrounding an Aphthona spp. release site ‘donut hole’ where spurge plant density is thinned out in response to attack by larval flea beetles) seem to be universally preferred by all Aphthona spp. Flea beetle releases establish and persist on sites that have coarser vs. fine grained soils with an organic matter content higher than 3% (optimally 6-9.5 %), and on south, west or east facing slopes more so than on northern facing slopes. Larval survival is higher on sites with soils that are well-draining, without extended periods of flooding that can kill the larval and pupal stages. Monitoring release sites will enable you to determine if and when flea beetles become established and can be harvested and redistributed to new release sites. Beetles are easily measured by volume, with 10 ml equivalent to approximately 1,000 adult Aphthona beetles. If you are able to collect 50 or more adult Aphthona spp. after sweeping for 5 minutes the year after you make a release, you can consider initial establishment of that release successful. If you are able to collect 500-1,000 adult flea beetles in 5 minutes of sweeping at 2 or more years after initial release, then the site is ready to be harvested for redistribution. As with other biocontrols, spurge flea beetles often achieve improved results when used in combination with compatible weed management strategies. 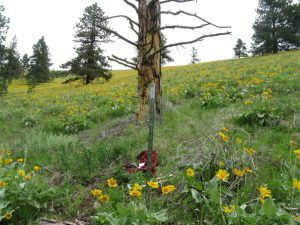 Herbicides labeled for use against leafy spurge are generally considered compatible with the release of Aphthona spp., although treatment applications should be staggered and not occur at the exact same time. 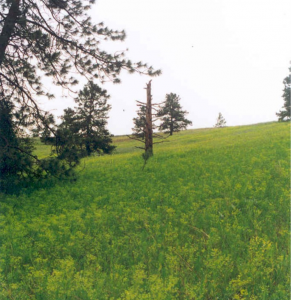 Herbicide treatments can be effective for quickly knocking down dense stands of leafy spurge, and when applied around the perimeter of large infestations to curtail the spread of spurge into uncolonized areas. Grazing with cattle, sheep and goats are similarly effective for improving the efficacy of this biocontrol agent by opening up dense spurge stands and reducing litter. Precise timing of grazing on leafy spurge increases its palatability to livestock and will ensure that animals do not spread seeds to uninfested areas. 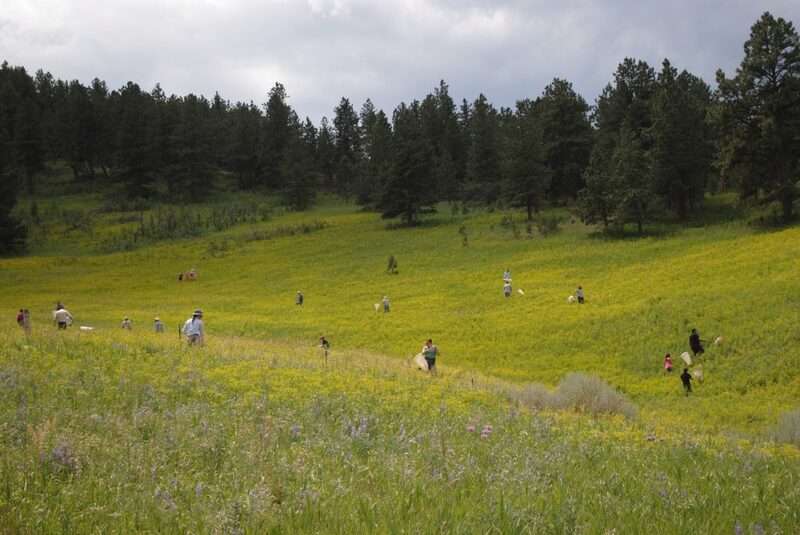 Additionally, aggressive revegetation, particularly with grasses, can provide challenging competition for space, nutrient and moisture resources exploited by leafy spurge. Larinus minutus and L. obtusus are very similar in appearance and biology. Eggs are elongate and white to yellow. They are found in pappus hairs. Larvae are approximately 8 mm long, white, c-shaped grubs with brown head capsules. They are found in seed heads where they also pupate. Pupae are slightly smaller (~6 mm) and white turning brown shortly before emergence. Adults are mottled brown with long snouts bent downward. L. minutus adults are slightly smaller (4-5 mm) than L. obstusus (5-7 mm). It is very difficult to differentiate between the two species in the field, however, L. obtusus is slightly larger than L. minutus. It is also less hairy. Additionally, L. obtusus prefers moister sites often near water and on south and west facing slopes. L. minutus prefers hotter, drier sites. Both are found in areas where competing vegetation is sparse. Adult weevils are active from May through September. They emerge from the soil as immature adults and begin feeding on knapweed foliage, stems and flowers. Females lay eggs on pappus hairs of emerging flowers. Over 100 eggs may be laid by one weevil. Eggs mature in approximately three days. Larvae feed on seeds, florets and pappus hairs. They feed for approximately four weeks and go through three instars before forming a pupal chamber from plant material. Adults chew their way out of pupal chambers leaving behind an empty cylinder in the center of empty seed heads. Adults overwinter at the base of plants in soil. There is one generation per year. Both weevils reduce knapweed density through foliar and seed feeding hence reducing plant vigor and seed dispersal. While both weevils have been found on several knapweed species, L. obtusus reportedly prefers spotted knapweed and L. minutus prefers diffuse knapweed. Their impact on these species and others has varied regionally. Both Larinus spp. are readily available in Montana. Due to their similarity, most releases will contain both species. If you are interested in obtaining these insects view the biocontrol vendor list for options. Larinus spp are strong fliers and are found in most infestations of spotted knapweed in Montana. 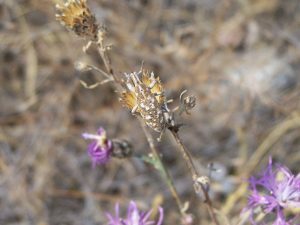 Landowners should monitor their knapweed infestations for Larinus establishment prior to purchasing or collecting insects to release. Adults are easily collected with a sweep net preferably before 50% bloom. After this females may have already laid a majority of their eggs. Adults can also be collected in the spring when they emerge from the soil at the base of plants. This weevil is best used in combination with other biocontrol agents and weed management strategies. Smaller, isolated knapweed populations should be controlled by other means including hand-pulling and chemical controls. On large sites where weevils are established chemical controls should be timed with both plant and insect lifecycles in mind. Consult your local weed district or Extension Service for herbicide recommendations. NRCS Montana. 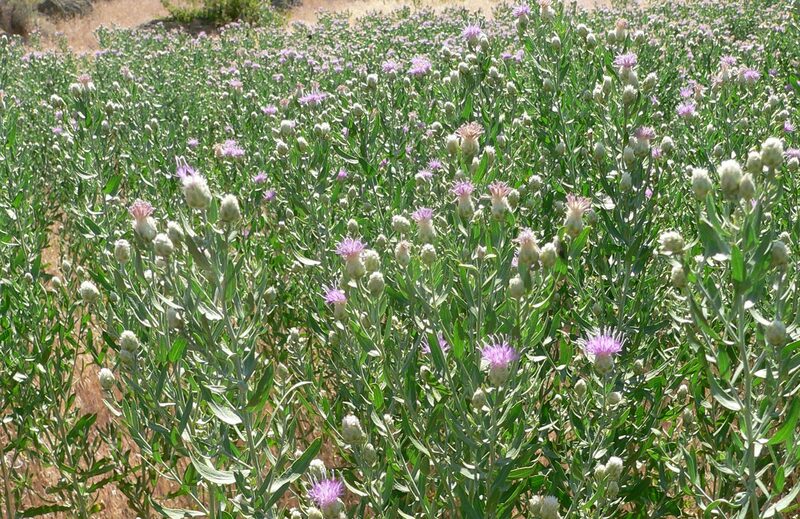 “Biological Control of Diffuse Knapweed.” Accessed January 18, 2017. https://www.nrcs.usda.gov/wps/portal/nrcs/detail/mt/home/?cid=nrcs144p2_056780. Eggs found at the root crown are white to yellow, darkening with incubation. Larvae are legless, have brown heads and c-shaped creamy white to yellow bodies. Larvae are found primarily in knapweed roots and can be up to 13 mm long. Adults are 13-15 mm long, mottled white and brown or gray. Males can be distinguished from females by the shape for the abdomen which is flat rather than round. Adult C. achates are much larger than other knapweed weevils and are lighter and mottled in color as oppose to black or brown like most other species (Larinus spp.). They can be difficult to see on plants but are usually found near the root crown and the tops of plants particularly on hot sunny days or when insects are mating. Larvae can be distinguished from most other root feeding larvae (Sphenoptera jugoslavica and Agapeta zoegana) by their c-shape, larger size and absence of legs. They prefer hot dry sites with high knapweed densities, minimal competing vegetation and bare soil. 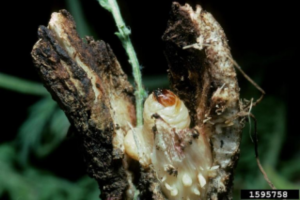 Larvae may form galls on roots and are typically found in the upper four inches of soil. Larvae overwinter in plant roots and pupate in early summer. In Montana, adults emerge from roots June through October with peak emergence in mid-August. Adults live approximately 8-15 weeks, during which time females will lay one to three eggs per a day. Females can lay over 100 eggs in their lifetime. 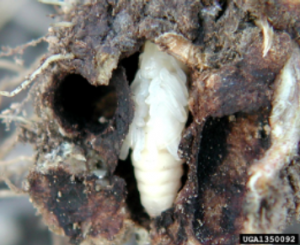 Larvae hatch from eggs in 10-12 days then burrow into roots where they go through three to four instars (stages of development) before pupating. These weevils have one generation per year. Root damage kills smaller plants and weakens larger plants. Feeding also introduces bacteria and fungi that can further damage plants. The larvae have the greatest impact when several larvae occupy one plant. This weevil is widely available in Montana. If you are interested in obtaining these insects view the biocontrol vendor list for options. Spotted knapweed is the primary host for C. achates in the USA, however, the weevil has been shown to have impacts on other knapweed species. Its damage has varied across the Western states with greatest impacts observed in Western Montana where it is well-established. Weevils can easily be collected from established populations with use of a sweep net. Collection is best on hot sunny days. 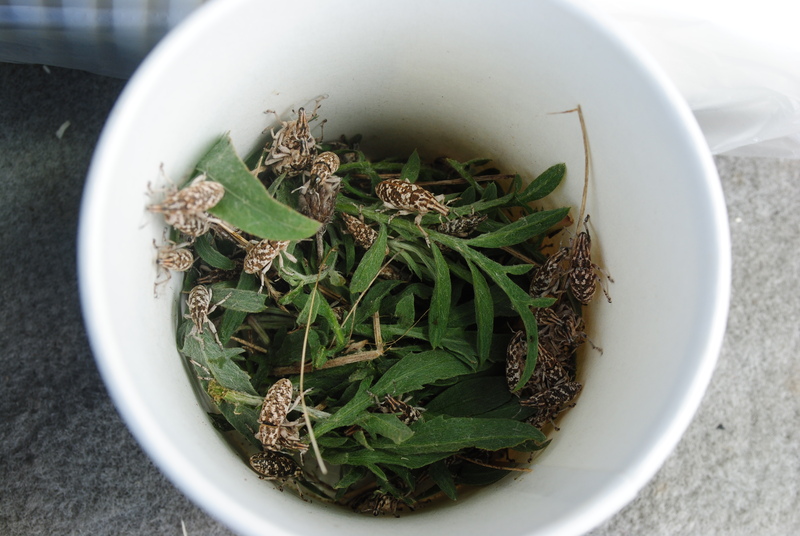 Insects should be kept in paper containers with knapweed foliage and stored at approximately 40F. Release insects in groups of 50-100 over a square meter area. This weevil is best used in combination with other biocontrol agents and weed management strategies. Like other biocontrols, the weevil is best used in situations of large, high-density weed populations. Smaller, isolated knapweed populations should be controlled by other means including hand-pulling and chemical controls. On large sites where weevils are established chemical controls should be timed with both plant and insect lifecycles in mind. Consult your local weed district or Extension Service for herbicide recommendations.